Dolphins are considered to be one of the most social animals in the world. They live in groups that are very complex and defined. Studies also show that the members are highly defensive of each other due to the bonds they form within their groups. Dolphins may greet as a way to socialize, and to also set boundaries within their groups. Through careful observations in their natural environment, it has been documented that the home ranges of various dolphin groups overlap those of others. For example, in Shark Bay Australia the Bottlenose Dolphins have been seen sharing parts of their habitat with other groups of the same species as well as other species of dolphins. The males of the groups have more dominance and they are more complex when it comes to their role within the group. They don’t defend territories and they don’t patrol but they will defend the members of their group if they need to. In the Western region of Australia, there is an open society of Bottlenose Dolphins that have been seen expressing a very open society. They don’t have defined boundaries like other animals or humans do. What is also identified is that the relationships they form are very strong and intense. In a book written by Richard Connor along with another author, they discuss the fact that most mammals that have such complex social interactions and relationships are found to live in semi closed groups with at least one female that is capable of reproducing offspring. Such females will be widely defended by other members of the group. Connor is also a Biology Professor at UMass Dartmouth and has also stated “an open society is one without such defended boundaries.” His studies include studying the behavior of 120 adult dolphins at Shark Bay, Western Australia. Also on this team were Michael Krutzen, Srdan Randic, and William Sherwin. What they learned is that the male Bottlenose Dolphins were engaging in pairing up with females or with another male. Sometimes, there would be a third member of the male group and it is believed this allowed them to herd females to a given location to increase the opportunities for mating. The observations also indicated that the males were often members of a secondary alliance that could have as few as four or as many as fourteen members. One of the groups is known to be active with seven members for at least the past seventeen years. All of this initial led the research team to think that the dolphins were living a hierarchy and social element similar to that of chimpanzees. This is due to the strong male bonding that takes place. However, the main difference is that chimpanzees are also very defensive of their territory and they patrol it on a regular basis while the dolphins don’t engage in such behaviors. 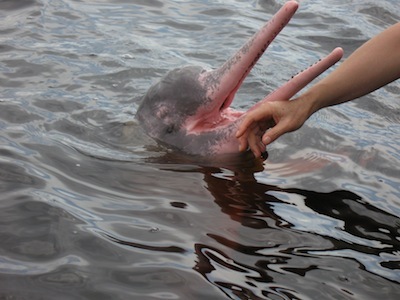 Dolphins are generally very gentle and they enjoy socializing and showing care towards each other. They are considered to be one of the most peaceful animals in the world, but they can be aggressive when necessary. There are very few noted events though where aggressive behaviors occur between two female dolphins according to the findings of Connor and his team. While males can be more aggressive towards each other, they don’t seem to engage in such behavior on an ongoing basis. There can be plenty of drama though in the dynamics of the male dolphins of any group though. Watching the complexities of these relationships has been very interesting and some great insight to how dolphins greet and how they live a life different from many other mammals in terms of social interactions.